The Expansion Monoblock projectile is similar in design to the critical duty 9mm ammunition by Hornady, which offers a “plug” in the “hollow” cavity to promote the expansion and uniformity of the bullet when it enters a target. While it is not exactly like the round mentioned above it does utilize some of the engineering principals. The all copper projectile is significantly less grain weight compared to a lead projectile. The post is integral to the bullet, instead of an additional component. The potential for proper expansion is heightened and the round, while being slightly lower weight, offers good stopping power for the caliber. 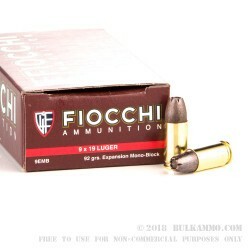 Fiocchi is now starting to innovate after many years of offering the standard loads for the world’s most popular cartridges. The unique ability to scale quickly and produce everything in house makes such easy innovation cheap and reliable for the company. 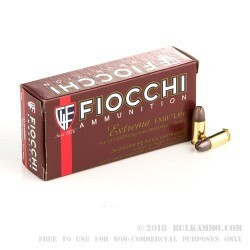 They are already producing all their 9x19 ammunition components in their factories in Italy and are beholden to no other entity for their continued growth. The innovation costs are minimized and they can scale rapidly due to the sales volume and low cost production they already have. 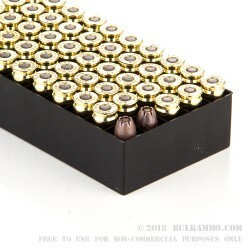 This is a 92 grain solid copper projectile with a semi-hollow-point design with a copper post, called a expansion mono block (EMB) round and it is loaded in a reloadable brass casing. Q: For home defense purposes, does an expanding full metal jacket round or an expanding mono block round result in less risk of multiple wall penetration? A: Both have the potential to penetrate multiple interior walls.